WCCLS extends its sincere appreciation to the Samuel S. Johnson Foundation for the generous grant of $1,000. We chose to use the funds to boost our digital library to include titles that match the Samuel S. Johnson Foundation’s mission of supporting nursing students, and improving access to health care for rural residents. Our digital library of downloadable e-books provide 24/7 access to information for residents of Washington County and use of e-books is increasing dramatically. They are particularly useful to residents who may not be able to access the library during open hours, due to their work or school schedules, or lack of transportation options. 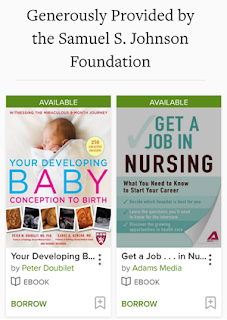 Check out the 35 titles we were able to purchase in OverDrive thanks to the foundation.